Trump’s Presidency has generated considerable uncertainty for a variety of important areas of the US economic policy, which have direct impact upon the world’s economy and security. To uncertainty, this administration is now adding big policy mistakes whose costs will be charged to the whole world’s economy. Since populism directly functions through economic woes, additional populist waves will lead to additional conflicts and social costs. Anyway, economic analysis points to a very high probability that Trump’s policies won’t make America great again but the contrary. After 18 months in charge, it is clear that – as announced during the electoral campaign – Trump’s administration is following a non-traditional approach of governance and unconventional economic policies. The most worrying aspect is the reversal of the US’s decades-long approach to freer trade and commitment to multilateralism and international cooperation, which had reached to build an economic order able to ensure and diffuse economic development. Indeed, globalization, which is the result of seven decades of efforts of the US geopolitical strategy, provoked some sectoral and geographically concentrated trade-related losses of Western manufacturing jobs, with a marked acceleration in the last two decades. This acceleration has stimulated an anti-elite feeling, nationalism, the opposite to globalization, and skepticism about international institutions. Indeed, the expansion of trade will impact the earnings of different factors of production. In the United States, this means a downward pressure upon the wages of low skilled workers, an increase in wages of some skill classes, and an increase in the returns to capital. To the extent that the highly skilled are the predominating owners of capital, the net effect of these changes is likely to increase income and wealth inequality, absent compensatory policies. Whatever the role of complementary factors in the electoral results like the Cambridge Analytica or Putin’s interferences, Trump’s selection in the Primaries inside the Republican party and his final victory are the result of the growing wave of populism as it is also the case in Europe with the Brexit, the anti-EU feelings and the rise of xenophobia. This popular reaction is explained by the cultural backlash against globalization which is driven by economic woes through two key-feelings: distrust for traditional policies and institutions, and anti-immigration. On trade policy, although Trump’s decisions are not yet very precise in their execution modalities or are postponed, the orientation is clearly protectionist along the mercantilist lines of his noisy campaign for exploiting the popular fears. This is the same regarding immigration. These two policies are about destroying the two main sources of US competitiveness and prosperity since the diversity brought about by immigrants together with trade openness were the two main economic drivers of the US innovation, R&D and technological leadership in the Global Value Chains. Ignoring the effective close integration which results from decades of free movements of goods, services and factors is a fatal error for the US prosperity and industrial power in the world factory. Higher US productivity and therefore its competitiveness and the US higher standard of living, are fundamentally based upon the organization and exploitation of Global Value Chains allowing for importing the cheapest and highest quality/diversity components in order to maintain structural competitiveness and extracting rents from the rest of the world. But Trump’s measures will tend to weaken this structural advantage and will also raise prices for domestic producers and consumers, implying a global loss of effective competitiveness. This effective competitiveness of the US economy explains the result in terms of current account (or trade) deficit through the combination of the (positive effects) fundamental structural factor – or the global fabric aspects of the US technological leadership – with the (negative effects) macroeconomic parameters as they result from domestic policy-mix choices, through the interest rate and exchange rate determination. From a macroeconomic point of view, the US global current account deficit is, by definition, the result of the gap between total income (insufficient) and expenditure (excessive) in this economy and could only be solved by policies acting upon this gap (the external deficit is merely the expression of the net dissaving of the US economy). Taking into account that protectionist measures inevitably tends to reduce real incomes (higher prices and less productivity) by indirectly taxing exporters, and that Trump’s macroeconomic policies tend to increase the excess of total expenditures (budget deficit drawing upon available savings) it is clear that the trade deficit could not be solved by such wrong Trump’s policies. His policies combine a fatal mistake of his populist option in protectionist trade policy with another big macroeconomic policy-mix mistake. Indeed, Trump’s policy options are not only attacking the structural determinants of the US prosperity and supremacy, but also simultaneously its macroeconomic stability component by accelerating at the peak of the cycle the demand-push with a dramatic debt accumulation to unsustainable levels through a simplistic, inopportune Keynesian fiscal policy. Republican Congress is allowing Trump to do an inappropriate pro-cyclical deficit spending policy while they had denied to Obama’s administration a smaller fiscal expansion when it was fully opportune for being counter-cyclical and socially balanced. Trump’s views of the trade deficit of the US economy comes from the simplistic mercantilist conception that neglects the roles of US macroeconomic imbalances and of the US dollar in feeding the global imbalances (the so-called Triffin dilemma). Keeping aside this too complex aspect for Trump’s administration understanding of economics, let’s just focus on the most obvious features of his fiscal policy that even a secondary school child could understand. 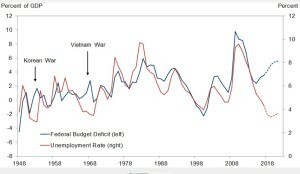 The recent voted budgetary laws – $1.5 trillion tax cut approved in December 2017 and a $1.3 trillion spending bill aimed at keeping the government operating through the end of the fiscal year – will blow a hole in the budget and pile onto the $21 trillion current debt load at the worst cyclical moment when the economy is at full employment (according to past parameters). Although the tax bill cut is skewed toward the rich (with lower impact on expenditures), the unemployment rate is at a historical low of 3.9% and the economy is in the eighth year of its post-financial crisis expansion. In case of continuing up to July 2019, the US expansion would become the longest in the whole American history! The chart below speaks alone: the projected deficits by the Congressional Budget Office are expected to grow from 3.1% in 2016 to 5.5% in 2021 while the unemployment rate would remain below 4%. 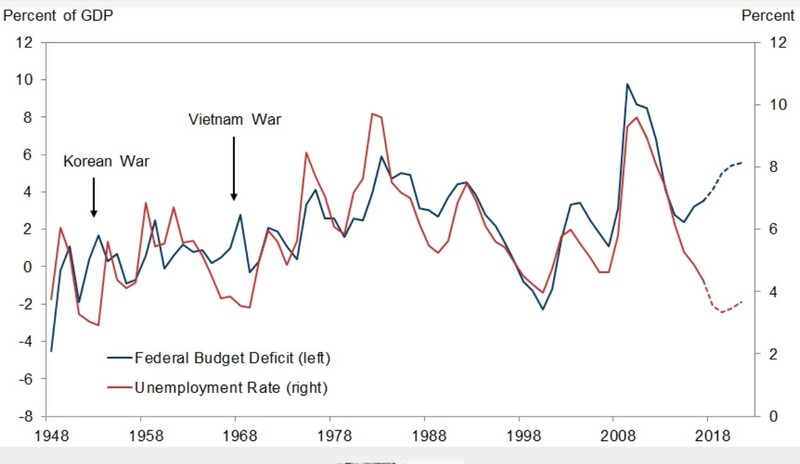 Historically, the only precedent of rising deficit while unemployment is falling was during the Korean and Vietnam wars, never in peace time. This means that to meet the growing debt load, the U.S. will have to issue more bonds when the Fed must tight its monetary stance. Budget-watchers have warned that the combination of the massive, unfunded tax cut and the spending deal would lead the U.S. deficit past $1 trillion by 2019 i.e. 5% of GDP and will continue to raise in the following years. After spending much of the past six years below the Fed target of 2%, inflation reached it in March 2018. One does not need to be a sophisticated forecaster to be able to announce the exploding interest rates with strong effects upon global financial markets and exchange rates. Of course, in 2018, growth will accelerate and overpass current forecasts, but the costs will inevitably be cashed from 2019 and beyond. Indeed, markets have already started to react. In mid-May 2018, the yield on the 10-year Treasury note hit a new multiyear height at 3.1 percent for the first time since 2011. More significantly, the spread between the 2-year and 10-year bond yields is hovering above minor support at 43 basis points. That’s its lowest levels since 2007, and a 25-basis-point hike in June, a near certainty among market participants, would leave the spread between the 2-year and 10-year yield at less than 25 basis points. Worries over a yield curve inversion are about to trigger additional selling pressure on the financial sector. If we consider the fact that the exceptionally low inflation since the 2008 financial crisis is not only because of the long-lasting depressing effects of this crisis but also to the massive supply-side effect of globalization, which uses to cap most of the output price pressures, one could realize the degree of gravity of both Trump’s mistakes combined. This “Trumponomics” will wake up the traditional price-wage inflation through the combination of supply contraction due to trade-protectionist measures with the demand-push due to fiscal deficit, accelerating the Fed restrictive monetary stance and exposing the US to a damaging “snow-ball effect” on its public debt which reaches presently 105% of US GDP. First, the holders of the US T bills –China being the mayor US creditor with around US $ 1.200 billion of these assets (and probably around 2.000 billion in total dollar assets held by Chinese institutions) and Japan the second one with 1.000 billon of US T bills) – could lose their patience and confidence into the US dollar, shaking up the whole financial system and provoking the worst crisis in history. Second, and in combination with the previous risk, retaliations to the Trump’s protectionist measures remain highly probable and should trigger a trade war as in the 1930s. Third, alternatively, a more positive reaction among the rest of the world for making a new mega-trade alliance between the EU, Russia, China and the rest of Asia plus Latin America and Africa for maintaining a free-trade area along the multilateral rules but excluding the US economy. Most multilateral US firms would then move out of the US and the Global Value Chains would be entirely reshaped without the US economy, which would end up as the greatest loser and not great again. We don’t pretend to forecast the probability of such catastrophic events, but we hope that – as it has been the case up to now with nuclear power – they could have similar deterrent effects for activating the US lobbying groups, the vested interests and the democratic forces, to prevent the suicide of the world’s first economy. Implementing Trump’s intentions would mean destroying the US prosperity and power and exposing the world economy to populism, shaking the social fabric and peace and security situations.